Ignoring pumps is a risk because when these components break down, or run below optimum efficiency, the whole process suffers. Manufacturing and process companies are always under cost pressure, making it vital to maximise assets and maintain uptime. Bearings in centrifugal pumps support hydraulic loads imposed on the impeller, the mass of the impeller and shaft, as well as loads due to couplings and drive systems. They also keep the shaft axial and radial deflections within acceptable limits for the impeller and shaft seal. The bearings often will face high axial loads, marginal lubrication, and high operating temperatures and vibration, all while the bearings attempt to minimise friction, which, if uncontrolled, can result in power loss, excessive heat generation, increased noise or wear, and early bearing failure. So, first and foremost, evaluate bearings (types, designs and arrangements) in the context of their anticipated operating environment. Suitable bearings are available to satisfy even the most difficult conditions faced by centrifugal pumps. Improper lubrication accounts for more than 30% of bearing failures. Good lubricants prevent metal-to-metal contact and undesired friction. The common methods for the effective lubrication of pump bearings include: grease, oil bath, oil ring, oil mist and air-oil. Oil mist generates the least amount of friction (allowing rotational speed to be based on the bearing design instead of lubrication limitations) and creates a positive pressure within the bearing housing (fending off invasive contaminants). Regardless of lubrication method, always specify lubricant according to the demands on vertical shafts and resistance to solids, pressure, temperatures, loads and chemical attack. Bearing seals in centrifugal pumps handle four crucial tasks. They retain lubricants or liquids, exclude contaminants, separate fluids and confine pressure. The choice of seal for centrifugal pump bearings depends on the unique demands and operating conditions of the application. Keep in mind, though, that the bearing and sealing arrangement represent an integrated system. Dynamic radial seals generally are the best choice for centrifugal pumps. These seals create the barrier between surfaces in relative motion. Seal selection ultimately must be based on a thorough review of application parameters and environmental factors. Particularly in pump applications, for example, seals will be exposed to relatively constant pressure differentials, making pressure seals (in which the seal cavity is pressurised) the preferred choice. Seals usually provide a much shorter life than the components they protect so don’t fall into the common habit of scheduling seal replacement only at intervals dictated by requirements of other components such as bearings. Regular measurement and analysis of key physical parameters, such as vibration and temperature, can detect pump system problems before they occur. Basic instruments can assess and report on vibration, temperature and other parameters. More advanced tools include online surveillance systems and software that can deliver real-time data. Many problems will manifest as vibration, which is widely considered the best operating parameter to judge pump train condition. Vibration can detect problems such as imbalance, misalignment, bearing oil-film instabilities, rolling bearing degradation, mechanical looseness, structural resonance and a soft foundation. 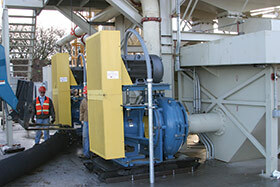 Vibration measurements are quick and fairly non-intrusive because pump equipment remains undisturbed. Operators can also play a pivotal part in proactive maintenance strategies by serving as the ‘eyes and ears’ to detect equipment faults before problems escalate and performing basic maintenance activities.